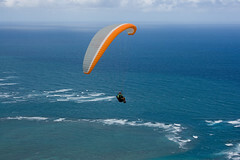 The Kahana die-hards enjoyed three days in a row of fun flying after almost a month of downtime. Definitely marginal days: very rainy or very windy or both. But despite the sketchy spots, we managed to enjoy the return of flyable tradewinds, with a few nice intentional XC trips and even one unintentional one. Visitors Arkansas Paul and Brazilian Fred joined the fun as well. Today seems like another marginally flyable day out there, but most of the die-hard crew decided to take a pass in favor of Ray's party this afternoon. See you all there! Sure was a fun couple of days! I have a few pics, but they came out soft. I think my lens was dirty. If there's anything salvagable, I'll post 'em up. Alex, nice shots, thanks man ! !